WAYNE ROONEY HAS explained how he felt “embarrassed” in his final years at Manchester United and was left with little choice but to leave the club. But the striker, who made his 120th and final appearance for England in a 3-0 friendly win against the United States on Thursday, revealed how he knew his United career was coming to an end when he felt reluctant to lift the EFL Cup trophy having been an unused substitute in the 2017 final. 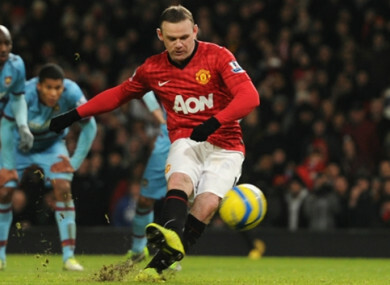 “There are times when you doubt yourself as a player, you think: ‘Am I good enough?’” Rooney told Sky Sports. It wasn’t the first time Rooney, now playing with DC United in Major League Soccer, had experienced a dip in confidence. Despite collecting five Premier League titles and the Champions League among an enviable haul of silverware, Rooney detailed how it took then-Manchester United manager Sir Alex Ferguson’s advice to get him back on track during a rough spell in the 2006-07 season. “I think there are periods throughout my career where you do lack a bit in confidence, where you doubt yourself at times. I think there was a time at Manchester United [2006/07 season] where I was scoring goals, and then for some reason I couldn’t score,” Rooney said. “You’re down, because I love football, love playing football, and after the games I’d go home and watch the games back, to try and see where I’ve gone wrong in certain moments, and I couldn’t work it out. It was so frustrating. I couldn’t work out why I wasn’t scoring, why I wasn’t playing as well. Then you end up trying harder, it becomes worse, you feel like you’re just stuck. Email “Rooney became 'embarrassed' at end of Manchester United career”. Feedback on “Rooney became 'embarrassed' at end of Manchester United career”.